The Supreme Court consists of the Chief Justice of the United States and eight Associate Justices. Power to nominate the Justices is vested in the President of the United States, and appointments are made with the advice and consent of the Senate. Moses and the Ten Commandments. U.S. Supreme Court (East Pediment). Article III, §1, of the U.S. Constitution provides that “[t]he judicial Power of the United States, shall be vested in one supreme Court, and in such inferior Courts as the Congress may from time to time ordain and establish.” The Supreme Court of the United States was created in accordance with this provision and by authority of the Judiciary Act of September 24, 1789 (1 Stat. 73). It was organized on February 2, 1790. “ “The judicial Power shall extend to all Cases, in Law and Equity, arising under this Constitution, the Laws of the United States, and Treaties made, or which shall be made, under their Authority;—to all Cases affecting Ambassadors, other public Ministers and Consuls;—to all Cases of admiralty and maritime Jurisdiction;—to Controversies to which the United States shall be a Party;—to Controversies between two or more States;—between a State and Citizens of another State;—between Citizens of different States;—between Citizens of the same State claiming Lands under Grants of different States, and between a State, or the Citizens thereof, and foreign States, Citizens or Subjects. Congress has from time to time conferred upon the Supreme Court power to prescribe rules of procedure to be followed by the lower courts of the United States. See 28 U. S. C. §2071 et seq. 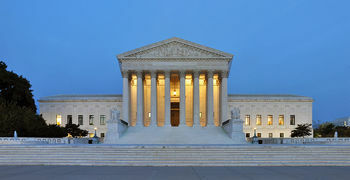 The Supreme Court building is open to the public from 9 a.m. to 4:30 p.m., Monday through Friday. It is closed Saturdays, Sundays, and the federal legal holidays listed in 5 U. S. C. §6103. Unless the Court or the Chief Justice orders otherwise, the Clerk’s Office is open from 9 a.m. to 5 p.m., Monday through Friday, except on those holidays. The Library is open to members of the Bar of the Court, attorneys for the various federal departments and agencies, and Members of Congress. The Term of the Court begins, by law, on the first Monday in October and lasts until the first Monday in October of the next year. Approximately 10,000 petitions are filed with the Court in the course of a Term. In addition, some 1,200 applications of various kinds are filed each year that can be acted upon by a single Justice. Court Officers assist the Court in the performance of its functions. They include the Administrative Assistant to the Chief Justice, the Clerk, the Reporter of Decisions, the Librarian, the Marshal, the Court Counsel, the Curator, the Director of Data Systems, and the Public Information Officer. The Administrative Assistant is appointed by the Chief Justice. The Clerk, Reporter of Decisions, Librarian, and Marshal are appointed by the Court. All other Court Officers are appointed by the Chief Justice in consultation with the Court. A Brief Overview of the Supreme Court by the Supreme Court of the United States. This page was last modified on 8 February 2014, at 21:40.